The 9th Annual Leadership Snowball Golf Tournament was held on March 23, 2015 at Arrowhead County Club.The event raised approximately 10,000 dollars. There was 50/50 raffles plus other raffles prizes and lunch was provided. The event began at 11am with a shotgun start. The golfers played on 4 man teams in the tournament. 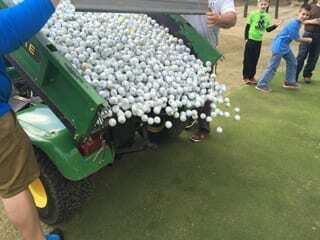 The picture of the golf ball drop shows over 2,200 balls getting ready to be dropped. The lucky hold of the numbered ball that goes in first will win that raffle. All proceeds benefit the Chamber’s Leadership Programs.